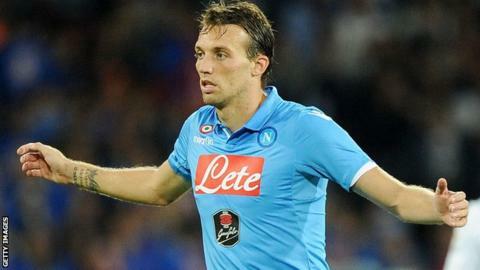 Swansea City: What next for on-loan Napoli forward Michu? Michu was valued at £30m last season but, without a goal since October 2013, Swansea City's once-prolific forward now finds himself on loan and on the periphery at Napoli. A revelation in his first campaign with the Swans, injuries and inaction have seen the Spaniard slide into relative obscurity with six goalless appearances for Napoli. Swansea manager Garry Monk will discuss Michu's future with him in the summer, and he faces a tricky decision. Should Monk convince the club's former top-scorer to stay at the Liberty Stadium once he returns from Italy? Or should the Swans offload a 29-year-old with one year left on his contract and a dwindling transfer value? "I've got a good relationship with Michu. We were team-mates so I knew him anyway and being a manager we have that relationship still," says Monk. "I talked to him very well in the summer, saw he wanted to go and I was fine with that, so it will be the same sort of situation come this summer." A £2m signing from Rayo Vallecano, Michu rather passed under the radar as pundits made their predictions for the 2012-13 Premier League season. He announced his arrival in spectacular fashion, however, scoring two goals in Swansea's 5-0 opening-day thrashing of Queens Park Rangers. Swansea were top of the table after three games and, with Michu scoring in all three wins, the languid, shaggy-haired Spaniard was soon ubiquitous. Manager Michael Laudrup described his acquisition as the "bargain of the season", while Sir Alex Ferguson joked he would be having a word with Manchester United's scouting department after failing to spot this hitherto unknown talent. With some of the Premier League's bigger clubs rumoured to be circling, Swansea gave Michu a new contract in January 2013 which would expire in 2016. Buoyed by his improved terms, he went on to score 22 goals in all competitions and was named Swansea's player of the year in a memorable season in which they won the Capital One Cup. Michu's seemingly irresistible rise showed no signs of slowing as he made a breezy start to his second season, scoring the first goal of the Swans' Europa League campaign in a 4-0 win over Malmo. He also struck in the famous 3-0 victory away against former Champions League finalists Valencia, as Swansea continued to dazzle under Laudrup. Michu's displays were particularly sparkling, catching the eye of Spain's World Cup-winning manager Vicente del Bosque and earning a debut in a World Cup qualifier against Belarus in October 2013. With the likes of Xavi and Cesc Fabregas in the Spanish side that day, Michu was in esteemed company. But that remains his only cap to date. After his winning debut for the then world champions, Michu soon saw his season fall apart. Less than a month later, he sustained what seemed to be an innocuous ankle injury during a 1-0 south Wales derby defeat at the Cardiff City Stadium. After a hasty return for two matches in December, Michu was sidelined until March, his last goal of the season coming in October. After an underwhelming end to his second term at Swansea, Michu joined Napoli on a season-long loan in what appeared to be an attempt to revitalise his career. However, the move to Italy has not proved to be the revival Michu had hoped for. The Spaniard has made only six appearances this season - his last coming back in October in a Europa League defeat by Young Boys. Injuries have hampered the 29-year-old but, even when fit, he has found himself behind Gonzalo Higuain, Lorenzo Insigne, Dries Mertens, Manolo Gabbiadini, Marek Hamsik and others in the attacking pecking order. Monk is sympathetic and believes a fit Michu - whether that is at Swansea or another club - could rediscover his former glories. "It's just his injuries. He hasn't had a sustained period when he's been fit, which is always hard as a player," says Monk. "He's been unfortunate - nothing else but that. "If he can get himself a sustained period when he's not injured, you will see the same quality he has always shown here."